If you’re looking for a safe way to protect your investments and to provide for your family’s future, then consider investing in gold. There has never been a better time to invest in precious metals and as the economy fluctuates, these assets have the best chance of retaining their value. Gold has been shown to reliably hold its value most of the time during an economic crisis and even to sometimes go up in value. This is simply because gold is scarce in quantity. While the bank might print more dollars leading to inflation, there will never be significantly ‘more gold’ and that means it will always retain its value. That’s why gold is chosen as the basis for currencies around the world! And this is also why you can rely on gold to maintain its value even in the face of inflation. What you spend on gold now is what your investment will be worth years and years into the future. This is the ultimate futureproof investment! Investing in gold coin is the perfect way to get started in gold investing too. This way, you get to enjoy what is known in the business as ‘direct ownership’. That means that you don’t ‘technically’ own the gold coin and you don’t ‘theoretically’ own it. Instead, you literally get sent the gold coin in plastic tubes or boxes and in whatever quantities you want. You can then choose to put them in a safety deposit box with your bank, or you can bury them under your bed. Either way, you’re not paying for the privilege of a company storing your gold coins and you’re not going to get charged or have to wait for months when you decide to withdraw or liquidize your coins. And there’s another great reason to invest in gold coins… they’re beautiful! Very often, gold coins feature stunning and culturally significant designs and by actually owning them in person, you’ll be able to inspect them up close and personal! One such great example? The South African Krugerrand 1-ounce gold coin. 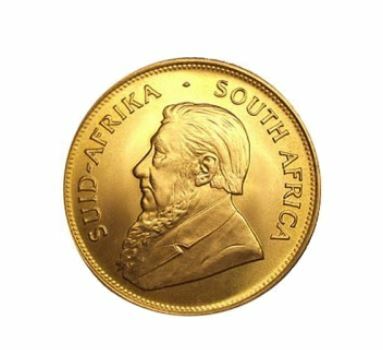 The South African Krugerrand 1-ounce gold coin features a portrait of the country’s first president: President Paul Kruger. The name of the coin itself (the Krugerrand) is actually a word derived by combining the name of that president with the name of South Africa’s unit of currency – the rand. That makes Kruger-rand. The image is a portrait depiction of the president, looking to the left and with detailed hair and lapels. On the reverse is an image of Springbok or antelope, which is an animal that is native to the region. This side also includes text showing the date minted and the weight hallmark. 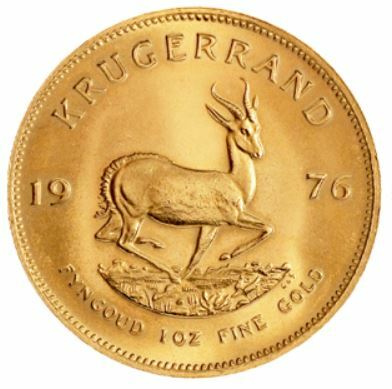 The South African Krugerrand 1-ounce gold coin was an instant hit when it was first minted in 1967. That’s because the coin moved directly to keep pace with the price of gold, while the 1 oz size made it very convenient for valuation. In 1980 however, smaller sizes were also created, including 1/2oz, 1/4oz and 1/10oz. All four of these sizes have a reeded edge, which is designed to improve security. There are actually two types of this coin in print, with one being the low premium bullion coin that is traded for its precious metal value. The other is slightly more expensive and is the collectors’ edition. This makes a great collectible coin thanks to its particularly striking design. While the coin was a big hit when it was first introduced, it actually fell in value for a while during the apartheid. However, it has since regained its share of the market and today competes with many of the other most popular coins, including the US gold Eagle and the Canadian gold Maple Leaf. That definitely makes this coin among the most popular mints currently available. Why is it so popular? Partly its popularity is due to the fact that it moves with the value of gold. Another big plus is that the premium above spot is one of the very lowest available on the market. The coin has an ounce of gold, which is alloyed with a small amount of copper for extra durability. This is a common practice. Another common practice seen here is the availability of hard plastic tubes from CoinSafe. These can hold 20 of the coins and make transportation and storage easier. This, combined with the readily available values for the coins, helps to make them particularly easy and convenient for investing as well as easy to come by. The South African Krugerrand 1-ounce gold coin carries no reporting requirement. However, if you sell 25 South African Krugerrand 1-ounce gold coins, then it will be reportable on Federal Form 1099B. This is another great coin to invest in and a good choice for those looking for something attractive that will also prove to be a savvy investment.